CollectingMagic.co.uk: Updated: Maskar and Mavis, Personal Photos from a Fringe Professional. Updated: Maskar and Mavis, Personal Photos from a Fringe Professional. Updates are below the original post. This set of three photos shows the little known magician Maskar standing in front of his show with his assistant Mavis and some other people. He's not a well known figure in the history of British magic but these provide a good snapshot of professional magicians in the 1950's. The pictures are of two different booths ran by the magician, possibly on Blackpool's Golden Mile as there are records of him demonstrating illusion sideshows there. They provide a rare glimpse of late sideshows in the UK which mainly faded away towards the end of the 1950's. Two other sideshows are visible in the backgrounds of these two images, though I have been unable to identify them. The man in the turban is Maskar and the woman is Mavis, who was possibly the main draw judging from the photographs used on the advertising boards. I can not identify the other people in these photos but I suspect they may be relatives of Mavis or Maskar. Maskar performed as a "white yogi", performing tests of pain and endurance alongside standard illusions. He is possibly best remembered as a tour companion for the escapologist Murray. Above is a proof for a poster printed in 1953. It shows Maskar in second billing to Murray, a place he occupied for much of his career. A while after this was posted I was contacted by an admin of the History of Blackpool Facebook page, Bob Kearns, who asked to share these images to the group. He posted them up and it got some really useful responses. 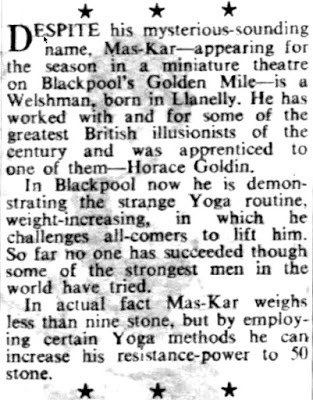 "[Robert] Harbin's Invisible Ray Illusion has a sideshow pedigree being shown for some years on Blackpool's Golden Mile by Murray and presented by Maskar." This was the first I'd heard of Robert Harbin's illusion being presented by Maskar for Murray, more of that in a bit. Pete Skinner also posted a clipping from the 4/6/1964 issue of The Stage. This great little clipping is filled with information that was new to me. He was Welsh, had worked with Horace Goldin and had a yoga themed strength act as a side show on the Golden Mile. Returning to the Harbin connection I was also contacted by Emma Heslewood, who's working on the exciting Blackpool Museums Project. She was researching Blackpool's connections to magic and we had a chat about magic history during which she shared more information about Maskar and Murray. I learnt that Maskar had worked for Murray presenting an illusion built by Harbin, known as the Invisible Man and Out of this World. "At the time when I left England for Bermuda, most of my cumbersome apparatus was disposed of. Some of it went to Billy McComb and the remainder to Davenports. It was to the latter that the "Invisible Man" was sold and a little later it was bought from George Davenport by Murray who conceived of the novel idea of using it as a side-show. Year after year he had this presented in the north of England always finding it extremely profitable. In the handling of this, I must give praise to Maskar who with masterly showmanship, proved to the spectators that they were watching a modern miracle." So there we go, I thought I had all the information on Maskar I was likely to find, until flicking through a book I've had for a few years I found a even more! Tug Wilson was an assistant of Murray (along with Cecil Lyle and Levante). His biography was published in 2011 by Arcady press, written with Christopher Brinson. 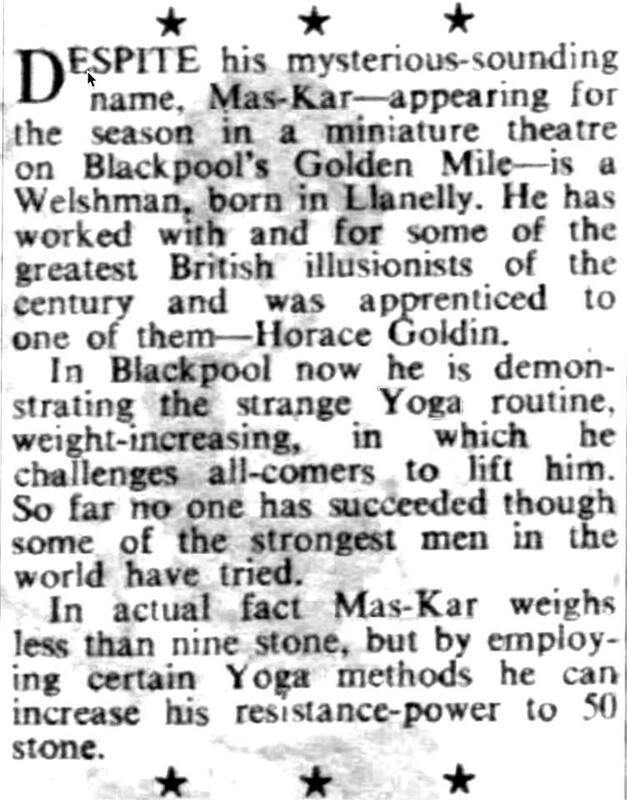 There's a great section on Maskar's yogi act "Menta Resista" and it states his real name was Lewis Evans. The book includes other pictures of Maskar and his sideshows that appear to be earlier than the three above. It describes how Murray moved into sideshows as a source of income and to keep his touring company employed after the decline of variety theatres. It was likely also due to Murray's health forcing him out of touring and into running a magic and novelty shop in Blackpool. Thanks to everyone who contributed information. Coins in Nests of Boxes. Robert Mason's Magic Shop Interior. Three Davenports Multiplying Money Trays. Hogarth's Take on an Early Magician. Steel Ball Through Glass, Two Versions. Wonder and Snuff Boxes by Demons and Vampires. Chung Ling Soo's Giveaway Flower and Token.